home Blog OverDrive eBook & eAudio updates! OverDrive eBook & eAudio updates! Finally! The OverDrive Media Console app is finally available for NOOK Color, Tablet, and the new NOOK HD and NOOK HD+ models. The app is available through the NOOK Store under apps. Once the app is downloaded, patrons can download eBooks and eAudiobooks directly to their NOOK over a wireless connection, similar to using the app on an Android phone or tablet, rather than downloading to their computer via Adobe Digital Editions and then transferring to their device. Updated Help articles have been posted to the ECRL Digital Library website. The version of OverDrive Media Console available in the NOOK Store is for Android. 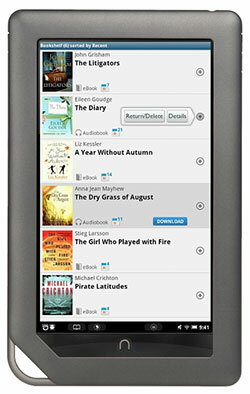 Any instructions related to Overdrive Media Console for Android will apply to the NOOK app. While the app is free, users will need a valid NOOK account in order to download the app. Adobe has officially released Digital Editions 2.0. It’s a new version of the software patrons use to read eBooks on their computers and transfer eBooks to eReaders like the NOOK Simple Touch, NOOK 1stEdition, and many more. Adobe Digital Editions 2.0 comes with a bunch of improvements and changes. Each eBook is now represented by a simple tile. There are no more hover-over context menus. 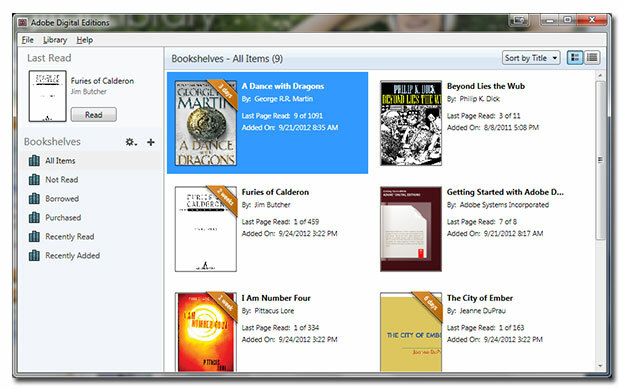 Instead, Digital Editions uses the standard right-click (or control-click for Mac) menu for individual eBook options. Activating compatible eReaders has also become much easier. 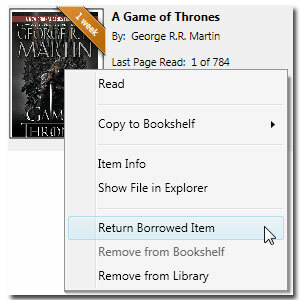 You just plug in the eReader you want to activate, and then drag the book you want to read over to the device. That’s it. The Adobe ID is automatically registered, and the book is transferred all in one step. Another bonus, Digital Editions 2.0 works with screen readers for low-vision and visually impaired users. The Digital Editions 1.0 will still work for patrons that already have it. New users will be downloading the Digital Editions 2.0. Update #3: OverDrive Media Console app is now available to Kindle Fire users in the Amazon App Store for Android. If you have any questions, check out the updated Help articles posted to the ECRL Digital Library Website. If you can’t find an answer there, contact any ECRL branch or Ask a Librarian.